Bike lane in danger? Cone power to the rescue! The corner of North Rosa Parks and Willamette. Portland’s unofficial defenders of transportation safety have once again come to the aid of a bikeway in need. On Monday, the anonymous group of traffic heros (or villains, depending on your perspective) calling themselves PDX Transformation (@PBOTrans on Twitter) placed two orange traffic cones in the buffer zone of a bike lane at the corner of North Rosa Parks Way and Willamette Boulevard. They were frustated at how many people would drive in the bike lane to cut the corner (a common problem Portland’s official transportation bureau is well aware of). So many people cut into the bike lane at this corner that the paint has worn off. And the behavior has gone on for years. Back in 2011 I wrote a short opinion piece accompanied by a vandalized sign at this same intersection. Someone had scrawled “5 points” under the bike/walk crossing symbol — as if people using the Rosa Parks/Willamette crossing are nothing more than mere targets in some sick game. 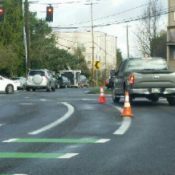 Reports coming in via Twitter show that the cones are still in place as of this morning. They’ve been knocked down, but people who ride by the location have taken it upon themselves to stand them back up again. Glenn Fee, who follows PBOTrans on Twitter said he plans to monitor the cones twice per day on his commute. PDX Transportation is very pleased that the cones have survived this long. To them it proves that permanent separation is needed — and would work — in this location. Late last night they posed a question to the Portland Bureau of Transportation (via Twitter): “Those cones have been up for most of two days; why couldn’t you put a concrete curb there?” So far, PBOT has not responded. These are the same activists that propped open TriMet’s swing gates along the Orange Line MAX at Southeast 11th earlier this month. They are part of what has become something of an orange cone revolution among transportation activists armed with nothing more than cones, paint, Twitter, and frustration. PDX Transformation sprung up after noting the success and notoriety of similar group in New York City. And now there are groups in San Antonio and Seattle as well. The power of a group like PDX Transformation lies in who sees their work and how/if it influences them. On that note, among their notable Twitter followers are PBOT, Timur Ender (transportation policy advisor for Commissioner Steve Novick), Elliot Njus (transportation reporter for The Oregonian), Dirk Vanderhart (news editor at The Portland Mercury), Reed Andrews (a reporter for KATU-TV), Maggie Vespa (a reporter with KGW-TV), Jennifer Anderson (reporter for Portland Tribune), Sarah Iannarone (Portland mayoral candidate), Gerik Kransky (advocacy director for the BTA), Peter Koonce (an engineer who manages PBOT’s Signals Street Lighting and Intelligent Transportation Systems division), Margi Bradway (manager of PBOT’s Active Transportation Division), and Jeff Owen (TriMet active transportation planner). Some of the right people are getting the message, the important thing is whether or not it will sink in and lead to real changes on the ground. 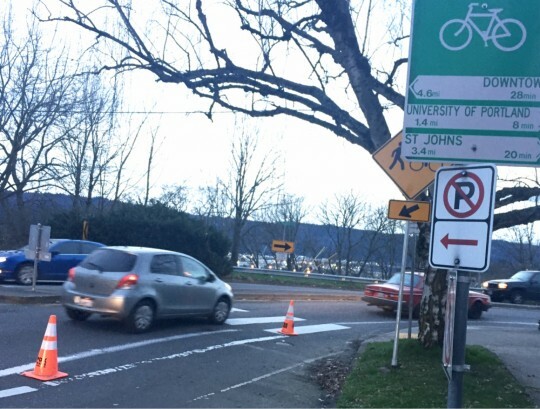 UPDATE: There is now a GoFundMe campaign to help buy more cones for PDX Transformation. BikePortland can’t survive without paid subscribers. Please sign up today. I feel like each one of those large cones needs 5-6 of thise little “baby” 12″ tall cones following it like a line of ducks. Maybe topped with a cheap plastic ruler (that flops around in the wind from passing cars) and some cheap version of those vibration triggered valve stem LED blinky lights; every time someone drives by the wind would set them off for a minute. Depending on how much sports team animosity you feel like stirring up you could start with the lime green cones instead and pair up that the appropriate colors. Hooray, cone activism! And activists! I like this. Now think big and expand on that! I would contribute to cone! They want to stay anonymous so I set one up for them. If people put out cones in their neighborhood and want to send/tweet us pics and a description of the issue that would be cool. I bought a couple cones like that and then placed rebar inside and filled it with concrete. Someone in a car/truck will know when they hit it. Yeah, I love the idea of doing rogue curb installations. At people will know who to sue, thanks. Oh! This is needed on E. Burnside between 74th & 73rd. The car lane is extra wide at the curve and the bike lane becomes extremely narrow (I’m guessing it was an inadequate paint job?) and still cars come into the bike lane, as evidence by the worn paint. It happens regularly right in front of me while I’m riding in. I know this pinch point all too well! It’s right in front of the fire station. @Todd H. …What fire station ? You mean the former firehouse that is now a residential site ? There are no fire stations within at least mile or so of this corner. Your comment however, has seemed to spawn an entire rash of unrelated comment drivel on firetrucks ! If 823-SAFE were working, I’d recommend asking them to fix the lane widths (they did that last year for a similar lane in inner N Portland… can’t remember the details or I’d link the BP article). Unfortunately I got an automated email reply today saying that due to heavy volumes they have a 4 MONTH wait time. I ride this corner daily, and take the lane when needed, then pass lazy cyclists meandering unaware in front of me. I hate lazy unaware road users, no matter their mode chice. Jonathan, can ya’ll confirm this report? If it’s true, would you please investigate whether PBOT pulled them. Very disappointing if they did. I am pro @PBOTrans efforts. At the same time, cyclist need to stop just barreling through from the quiet section of Willamette Blvd, across the curve where Rosa Parks becomes Willamette heading toward U of P, daring cars, Tri-Met buses, FedEx trucks, even joggers and partners pushing strollers not to stop for them. These is exactly the type of self-righteous tom-foolery that makes people ANTI bicycle. I see it way too often. Commuting is not a race. I ride this section often and I have the opposite experience. I come to a complete stop and start waiting for a break in traffic… 9 times out of 10, a “nice” person will come to a screeching stop and then wave me out into traffic. Usually the traffic going the other way doesn’t stop, though. So I stay stopped. Finally the “nice” driver gives up trying to be nice and drives off in a huff, probably wondering why I wouldn’t take advantage of his or her good charity. That is true too, unfortunately. That exactly describes my first automobile crash lo those many eons ago. Except I was an idjit and pulled out when they “helpfully” waved me on…. directly in to being T-boned. Lesson learned? Legally only an official police traffic officer directing traffic can be held responsible for bad directions into traffic. Also, you should expect every unseen space to be filled with high velocity car just as all firearms should assumed to be hot/unsafe until cleared and safeties are engaged. …and just as deadly or more deadly as those firearms! State law does not require the driver on the other side of a median to stop for a person crossing the road until they reach the median. the person that stopped for you was helping you trigger the law, and you failed to take advantage. Yea, for Jay ! Sanity, I appreciate that. Thanks for your comments. That’s a different story entirely, one that we’ve heard many times before, but usually not here. Just go sit there for six hours… Watch the reality that is. I assure you, that you shall see numerous cyclists blow the stop sign, and roll out into traffic. You will also see motorists performing all types of idiotic moves as well. “barreling through”. Those damn scorchers. How many bike-on-ped fatalities before we force them to go less than 20mph? Ted… This isn’t about bike mass. Agreed. 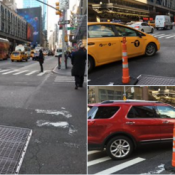 It’s about drivers pretending to give a @#$% about pedestrian safety. I’ve witnessed cyclists not giving a poop either. It’s not about mode. It’s about human behavior. i do most of my shopping, imbibing, eating, and entertainment trips by foot. people driving constantly and illegally threaten me as i attempt to cross roads in my neighborhood. there is absolutely no comparison in my experience. PBOT should simply prioritize the right kind of traffic at this intersection with stop signs at the crosswalk on WIllamette. Then you can complain about all the cars that don’t come to a complete stop and barrel through impatiently. I ride this way home every night. That crosswalk at Rosa Parks/Willamette needs to include lighted beacons. I always stop, and most motorists I see do the same thing, when someone is attempting to use that crosswalk. Lighting it up like the crosswalk in front of UP would only make that crossing that much safer. How much does a Jersey barrier cost? Water/sand-filled plastic ones can be had for $200. I wonder if we could get them in “bike green”. 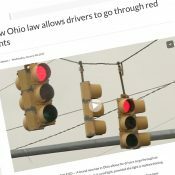 I wonder if they could be painted in such vibrant retina searing fluorescent colors that automobile drivers would divert from 2 or more blocks away. The median is there to slow cars down and make the crossing safer. The space inside the curve is there so legal trucks can make the turn. check out the power pole next time you ride by. the metal protective plate was there long before the median went in. I rode past here at lunch-time today. It would appear that someone didn’t mind running into the cones because the second one was in the middle of the crosswalk in the bike lane. I had to go towards the traffic lane to get around it. I wasn’t aware of the purpose or I would have stopped and re-positioned the cone, but I assumed it was part of a typically poor construction diversion. I try to reposition every construction cone I see, even if there are workers still there. Hoping it sinks in. We don’t like things that inconvenience US personally. We do like things that are free. How much do “Traffic control Change” signs cost? if there was one of those on my commute before the cones I may have known what they were for. It’s not a traffic control change. Maybe leave the “we” put of it. Not sure who you’re referring to as “we”. Personally, these cones are not an inconvenience, either as a motorist or a cyclist. I think part of the problem is your description of “the right people”. A solution at this location needs to consider legal truck access. something low that could be run over by a truck’s rear tires in the buffer area that would last (not wands, recall the test on Willamette at Bryant). A low median, maybe 3 inches high, similar to the corners at St Johns/Ivanhoe or 11th/Clay, like a roundabout’s truck apron. maybe with some texture to deter auto traffic? I guess I don’t understand the “legal truck access” thing. What if that truck were approaching the curve when a cyclist is present? Is it just collateral damage? There is NO TIME when it should be acceptable to cross into the bike lane OR the buffer. End of story. We need to stop designing our streets around the largest vehicles, and design our vehicles to our streets. The modern fire truck is a perfect example. They design the truck, sell it, then browbeat city planners to set minimum width regulations everywhere. All in the name of “safety”! We could always go back to horse drawn fire wagons. I would love to see how you would love that when your house is on fire. LMFFAO ! HA ! Since when is it legal for truck drivers to drive over bike lanes? racetrack. you’ve built a racetrack. Even the trimet bus on google’s street view is clipping the bike lane. You think it’s going 10mph? If your design-case vehicle is exceeding the advisory speed, the lane is too wide. What pole? They took it out, so now you’re not even safe on the sidewalk. Lots of room on the left side of that bus. I think you call this “hitting the apex.” An articulated truck might have to drop a wheel over the line to make that corner, but if it’s going <10 MPH that's not going to matter. If a cyclist _chooses_ to pass a truck in that corner– oops. Surely this is not a truck route anyway? There was also a cone on N Williams at N Alberta today, attempting to keep people from turning across the bike lane too soon, I would imagine. I wonder if it’s the same people.